The United States announced on Wednesday that peace talks to end the war in Yemen would begin next month in Sweden. The announcement came amid growing global pressure to stop the bombing campaigns by a Saudi-led coalition that have unleashed conditions amounting to possible war crimes, according to a United Nations report in August. The announcement by Secretary of Defense Jim Mattis at the Pentagon came on the heels of a statement by the aid agency Save the Children on Wednesday that underscored the harrowing nature of the conflict: An estimated 85,000 children might have died of hunger since the bombings began in 2015. 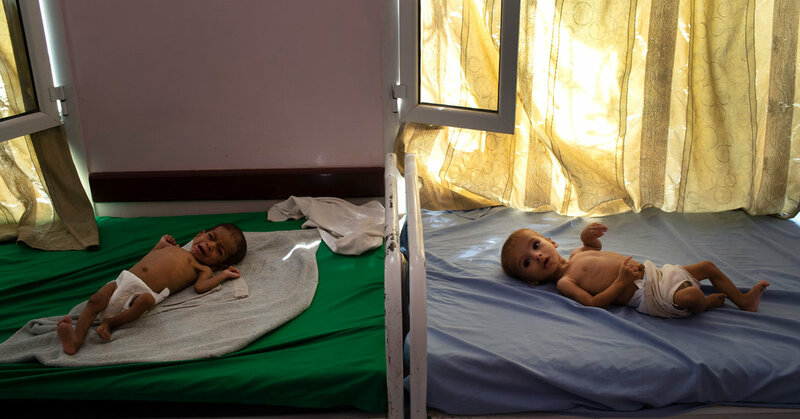 Experts say Yemen has become the worst humanitarian crisis in the world, and 14 million people could soon be on the brink of starvation, according to the United Nations. The statement said that 85,000 was a conservative estimate of how many children under the age of 5 had starved between April 2015, when Saudi Arabia began its air war, and this October. In addition to the airstrikes, Saudi Arabia has imposed economic sanctions and blockades on Yemen, contributing to the deepening humanitarian crisis. New York Times reporters have examined the toll of Yemen’s war. David Beasley, the managing director of the World Food Program, visited Yemen last week and painted a dire portrait of the situation. “What I have seen in Yemen this week is the stuff of nightmares, of horror, of deprivation, of misery. And we — all of humanity — have only ourselves to blame,” Mr. Beasley told the United Nations Security Council on Friday. Since the spring, the price of basic food staples has doubled, Mr. Beasley added. “For a country that’s dependent on imports for the basic needs of life, this is disaster,” he said. As the death toll from the military operation worsens, rebuilding the economy has emerged as a priority to prevent widespread famine. Saudi Arabia intervened in Yemen’s civil war in April 2015 to fight the Shiite rebels backed by its regional rival, Iran. But instead of a quick victory, the Saudi-led campaign evolved into a bloody stalemate. The bombardment, which relies heavily on arms and equipment from the United States, has torn the country asunder. Because of fighting around the port of Hudaydah, a crucial gateway for aid efforts, humanitarian programs have been scaled back, the United Nations special envoy for Yemen, Martin Griffiths, told the Security Council on Friday. Save the Children said it had been forced to reroute supplies for the north of the country through the southern port of Aden, with deliveries taking three weeks instead of one. According to Stephen L. Anderson, country director for the World Food Program in Yemen, 8.4 million people are considered to be severely food insecure, one step from famine. “Now, based on analysis and projections, that number could increase by 50 percent or so,” Mr. Anderson said in a phone interview on Wednesday. “Even if peace were to break out tomorrow, which is very unlikely, we’ve still got a massive humanitarian crisis on our hands,” he added. In his embrace of Saudi Arabia, Mr. Trump has dismissed his own intelligence experts’ conclusion that the kingdom’s young de facto ruler, Prince Mohammed bin Salman, had ordered the killing of the dissident Jamal Khashoggi, fueled his “America First” agenda by touting a huge Saudi arms deal and doubled down on the need for the Saudis’ help in the Middle East to contain Iran. By largely absolving Prince Mohammed of any responsibility in the killing of Mr. Khashoggi — “Maybe he did and maybe he didn’t!” Mr. Trump said — he ignores a documented list of humanitarian disasters and rights abuses by the kingdom, and his pardoning of Saudi Arabia could embolden autocrats across the globe, analysts say. This month, the United States said that it would end air refueling flights for the Saudi military campaign in Yemen and prepare sanctions against Saudis linked to the killing of Mr. Khashoggi. But those steps were seen as limited and in response to overwhelming international condemnation. The United States Agency for International Development has said that the United States was providing more than $ 566 million in aid to manage the humanitarian crisis. In a fact sheet published Nov. 9, it pointed to the damage done to civilian infrastructure following the Saudi coalition’s deployment around the port city of Hudaydah. Mr. Mattis did not specify a date for the peace talks for fear of coming out ahead of a United Nations announcement. Mr. Mattis added that the Saudi-led coalition had stopped its offensive around Hudaydah before the talks.